TOKYO, Apr 16, 2019 - (JCN Newswire) - Mitsubishi Heavy Industries Machine Tool Co., Ltd., a group company of Mitsubishi Heavy Industries, Ltd. (MHI) based in Ritto, Shiga Prefecture, has commercialized a metal 3D (three- dimensional) printer applying laser-based metal additive manufacturing technology, and delivery of the first unit was completed in March to the Industrial Research Center of Shiga Prefecture, which is also located in Ritto. Through adoption of a proprietary Directed Energy Deposition (DED) method(1) in which metal powder material is continuously fed by nozzles to the laser fusing point with pinpoint precision, a commercial model was achieved capable of laminating diverse metal materials at high speed. Going forward, MHI Machine Tool and the Industrial Research Center will collaborate in developing technological innovations relating to metal additive manufacturing. The metal 3D printer was developed under a research project(2) of the New Energy and Industrial Technology Development Organization (NEDO), with participation of the Technology Research Association for Future Additive Manufacturing (TRAFAM). TRAFAM has sought to create a next-generation metal DED and additive manufacturing system employing MHI Machine Tool's accumulated laser and positioning control technologies. Development of a prototype unit was completed in October 2017, and after commencement of an advertising campaign targeting full-scale marketing, an entry model has been launched that is dedicated to manufacturing prototypes of small parts. Applying a proprietary DED method, laser beams emitted through dual nozzles pass through surrounding metal powder, causing fusion (immediate coagulation) at the focal point, and nozzle movement results in progressive additive manufacturing. Molding speed is more than 10 times faster than the powder-bed fusion method of extracting a formed object--whereby, after the metal powder has been spread and manufacturing has been completed by fusion and coagulated lamination, the superfluous unsolidified powder is removed--and metal powder waste can be suppressed. Because it is possible to perform additive manufacturing to a part's surface by way of repair, to double-laminate different metal powders, and to manufacture large parts, significant expansion of applications is anticipated through innovations during the processing phase and combined use with other machine tools. As the system becomes widely adopted, issues will arise concerning maintenance and management of the quality of the manufactured metal materials, and in response MHI Machine Tool is now developing monitoring feedback capability that will automatically monitor and stabilize the manufacturing status, as well as a shielding function necessary for manufacturing titanium alloys, etc. used in the aircraft and space fields. Practical achievement of these targets is now within view. In April 2019, the Industrial Research Center of Shiga Prefecture has newly established an Advanced Monozukuri Prototype Development Center within its premises. The metal DED and additive manufacturing system is to be installed within the new facility, to support the development of new products and technologies of companies engaged in monozukuri: the traditional Japanese concept of craftsmanship. 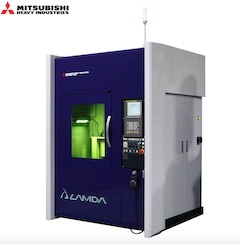 Going forward, MHI Machine Tool, in collaboration with the Industrial Research Center of Shiga Prefecture, will focus on winning expanded recognition of the metal 3D printer within the manufacturing industry, as well as on developing new applications from the user's perspective, to make laser machining systems a core entity among its new businesses. (2) The new product applies the results of the project undertaken with NEDO funding.